Simply adopting the right policies and complying with the rules can no longer achieve good nonprofit governance. 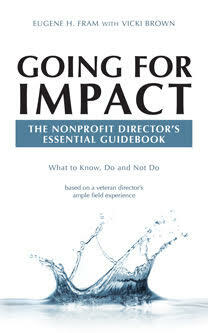 As increased scrutiny of the board’s mission imperatives (for example, via IRS 990 Forms) intensifies, both directors and management must be willing to respect the boundaries that define their exclusive roles while working together to ensure that their actions support the goals of the nonprofit and its various stakeholders. To help determine whether or not a nonprofit board can be classified an autonomous, the following questions must be considered. •	What are the roles of the CEO and senior management in NFP governance? Are these roles reasonably clarified? NFP boards or individual directors can easily default to micromanagement. There needs to be a process for senior management to easily call the attention to the for board corrective actions. Also, what are the board and staff responsibilities for fundraising? Both must work together effectively to meet financial goals. •	How does the work of the board and its committees actually get done? NFPs can have a proliferation of committees on the mistaken premise that the greater director board involvement leads to better director engagement. Only meaningful engagement achieves true involvement. Three to five board standing committees should be sufficient. Have ad hoc committees or task forces, composed of staff and directors; then study major policy changes or assess major opportunities. •	How proactive is the board in challenging management and shaping the nonprofit’s strategic direction? Many nonprofit directors are at a disadvantage because they are not intimately acquainted with the field in which the nonprofit operates. Consequently, when presented with strategic decisions, directors must be ready to “drill down” on the issues involved, even if their questions appear to be naive. •	What is the right balance between transparency and confidentiality in the boardroom? For-profits and NFP are being asked to be more transparent. Financial information must become current and readily available to the public. However, with some personnel information and non-material internal concerns, confidentiality is needed. A constant issue facing boards is how the latter category of information, if made public, will impact the operations of the nonprofit? For example, at what point, should a NFP board announce the resignation of a short tenured CEO? Such a rapid change might raise questions about the organization’s viability? •	How effective is the NFP board as a resource and support for management? The NFP board topically represents a community, profession or an industry. Consequently, the board needs to continually provide management information related to client concerns and opportunities. In addition, the board has an obligation to develop financial support for the nonprofit. However, the CEO still has a responsibility to have state-of-art knowledge about the field to support those directors whose occupations are adjunct to the mission the nonprofit. Thoughtful nonprofit boards are always looking to improve how they operate. Applying the above questions and comments to a specific board situation can open a discussion to move a legacy board to become a 21st century autonomous one. *John C. Wilcox, (2013) “The Autonomous Board,” Sod’ali Aligning Interests, October.